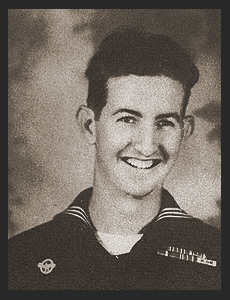 RM 2/c Grady Bob Burrows, son of Mrs. R. D. Burrows, graduated from Tipton High School; husband of the former Carolyn Catlett. Entered the Navy in 1942, trained in San Diego, Los Angeles, Cal. ; served in the Philippines, Austrailia, Canada, Panama, the Admiralites, the Gilberts, New Hebrides, Pearl Harbor, Guam, the Marshalls, the Solomons, New Guinea. Awarded Am. Theatre Ribbon, Asiatic Oacific Ribbon with three Battle Stars, Philippine Lib. Ribbon, ETO Ribbon.